The masthead and footer are customized with your company logo and information and the articles link to a companion Online Version which we build and maintain for you (see here for Online Version details). Another great feature of the Online Version is that it can include additional pages with information that you want to communicate to employees (example). 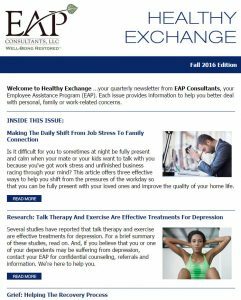 Healthy Exchange is the best newsletter available for you to customize with your Employee Assistance Program information and promote your EAP services to employees. 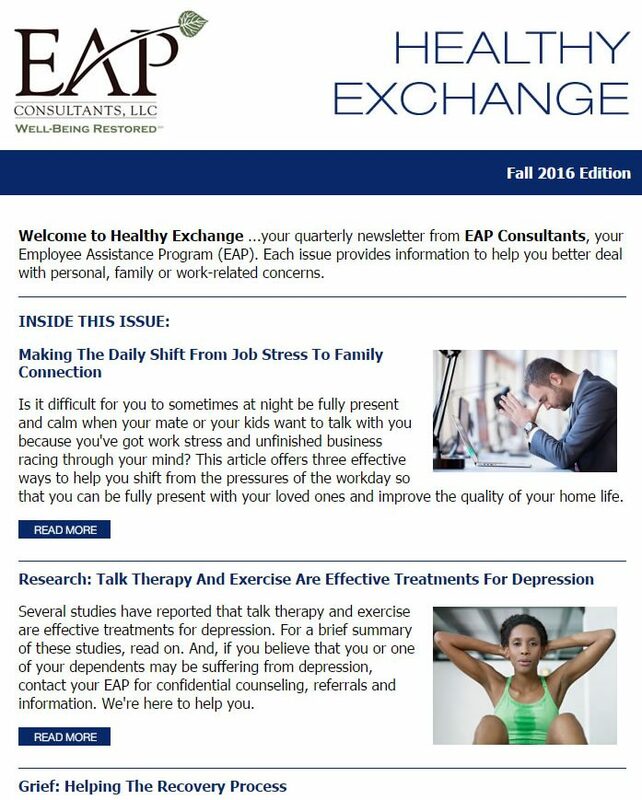 Proudly published for EAPs since 1997. If you have a question about any Healthy Exchange product, please contact me by phone or email. I’d love to learn about your business and needs… and see if we’re the right company for you. Do You Need Help With Content For Your Blog? Do you need help with content for your blog or for other use? We can provide you with content… and even take responsibility for updating your blog with content and images so that you don’t even have to think about it. 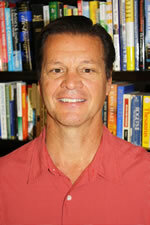 Contact Eric to discuss your needs and learn details. © Healthy Exchange. All Rights Reserved.